Mariposa's Tales MARIPOSA'S TALES: Sunday Siesta! It's Sunday afternoon here and I'm bored...yet too tired to go out. So we just decided to let the masseurs to come to the house so we don't have to go out to get a massage...I'm supposed to go swimming but I'm canceling that one...well, moving it to tomorrow actually! And so I snatched this Meme from Grey...feel free to do this when bored! Fresh milk! I can only take cold milk...for whatever reason, hot milk makes my tummy ache! Fish n' Chips to be specific...I love the fish and the deep-fried chipped potatoes! * any local veggies (can be leaves of sweet potatoes or eggplants) steamed and dipped in vinegar with some spices...I really do not know how to explain this one. * lettuce, tomatoes, ham, cheese with mayo and ketchup! I don't have a place that I CALL my favorite! I chose the place depending on the occasion and who I am with...most of the time though, I prefer to go to a place which serves Japanese food! I only eat burger when I'm at McDonald's, and I usually get cheeseburger or the quarter pounder with cheese! It should be Ayala Mall...any of their chains! I rarely watch TV...so I have no preference! Whichever gives me the best service...for international banks, I have CitiBank and HSBC...for the local banks, I have China Bank and Union Bank. 16- Your favorite hair color? The shade of my hair now...I can't describe it well...it has a shade of medium brown and auburn! And now for the weekly Unconscous Mutterings...here goes! 2. 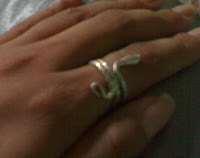 Snake :: My ring! 3. Assignment :: a project?! 6. Adventure :: Always fun! 7. First time :: Rookie?! 9. Grip :: get a grip?!! Those are wondering mutterings. And I like cheese too. 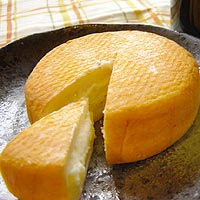 I eat anything that has cheese. Pizzas, twisties, cheezels, anything! lol. My mother keeps saying I'm going to get fat. But well, I'm going to enjoy until I get fat then. Lol. Fun meme but way too many questions for me to consider at one time! I enjoyed your mutterings (especially your ring) ... mine are posted at Small Reflections with my 4th Camera Critters photos. Are YOU in charge of Fun Monday this week? Guess I'll do some looking around before I leave ... because I've been doing Fun Monday for the past month or so too. Massage at home sounds delightful! Your UMs were great. We matched on one. My daughter was telling me about Tribal Wars (some of her friends play) and I said that you do them and that you post about it. I will tell her about your new aquisitions. Is Black chocolate the same as dark? Why am I starving to death? Enjoyed the MeMe...now pass the cheese and chocolate, please. ANd, the fish and chips. When I think I chips, I think of Fritos or Doritoes...but I love the chips that go with fish the best. I'm in for Fun Monday, but I will warn you now, I'll be on the road and my post may have nothing to do with your assignment...in Swampese: I may not follow the rules...for once. The only milk I can drink is the milk that doesn't have that bovine growth hormone in it. that stuff makes me sick. suddenly, i'm very very hungry. Mmmmm....Fish and chips :) I can only do cold milk too. I loved reading these about you!